Today's 31 Day Challenge prompt is "inspired by a flag" and I decided to create a variation on the American flag using textured polishes. It's pretty simple in concept and in execution and yet it has a fancy end result! This look was created by starting with a base of OPI My Vampire is Buff. I figured the textured polishes would get a little faded after sponging them on, so I chose an off-white base to go along with the faded style. After letting my base dry completely, I placed striping tape going down my nails, creating a sort of half moon shape near the cuticle. Then, I painted OPI Get Your Number and OPI Magazine Cover Mouse on to a triangle makeup wedge. I use it to do two rounds of sponging over the tape, and then removed the tape to reveal the off-white stripes. TIP: Remember to block off your fingers to protect them from the mess. Dry Elmer's glue, tape, or Liquid Palisade are all great options! 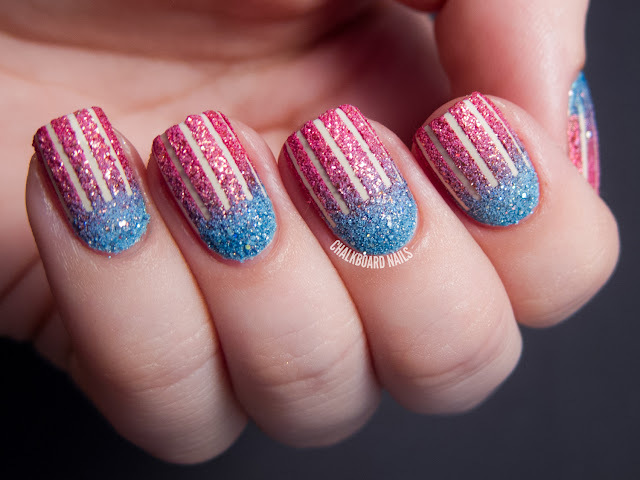 Tape nail art using textured polishes is always really intriguing to me. The combination of smooth and rough in one manicure is so delectable! 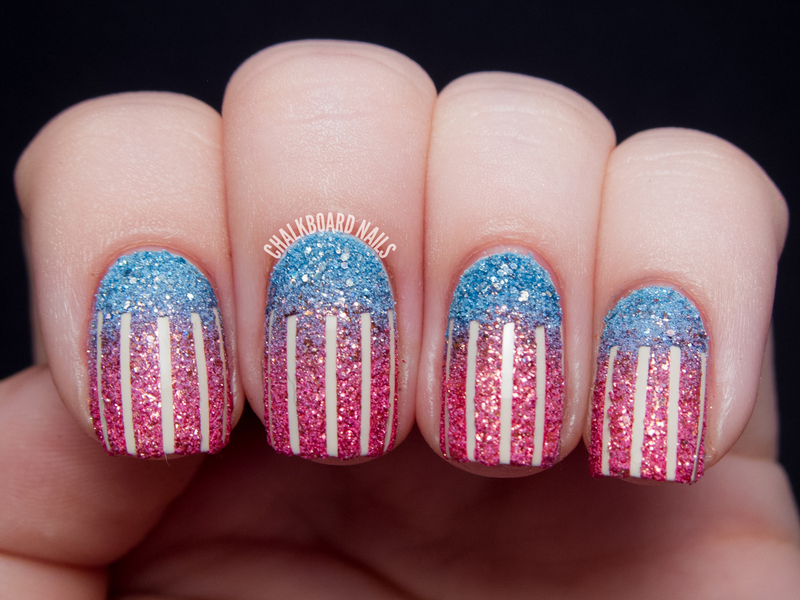 My flag nails from 2012! 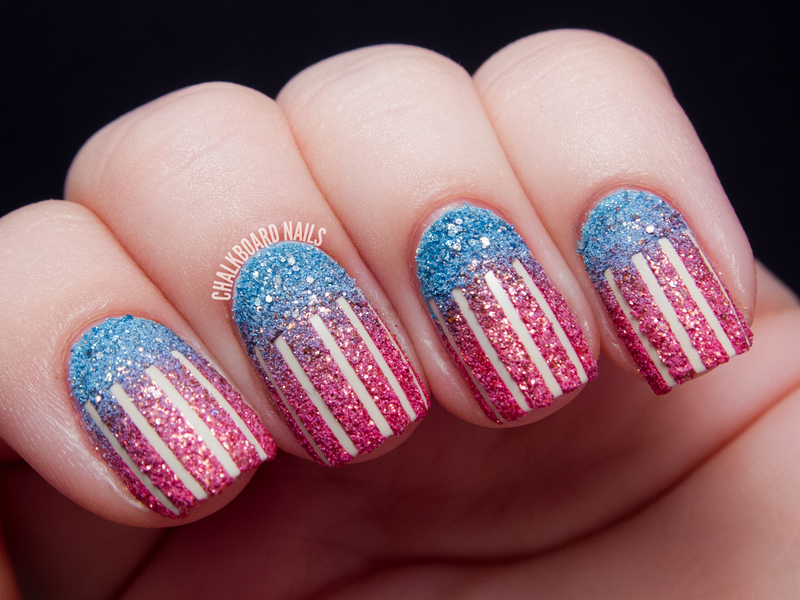 My flag nails from 2011! This looks sooo cool! I love how it looks even more textured than when the liquid sands are normally applied- is that because you used a sponge? this is more than great!!! This is awesome! I love how it turned out. This looks so cool! Love the way it looks! What is this sponge technique you're talking about? That is really impressive! Even the light sparkles in the blue look like the stars on the flag. Awesome idea and great job! This is an awesome look! 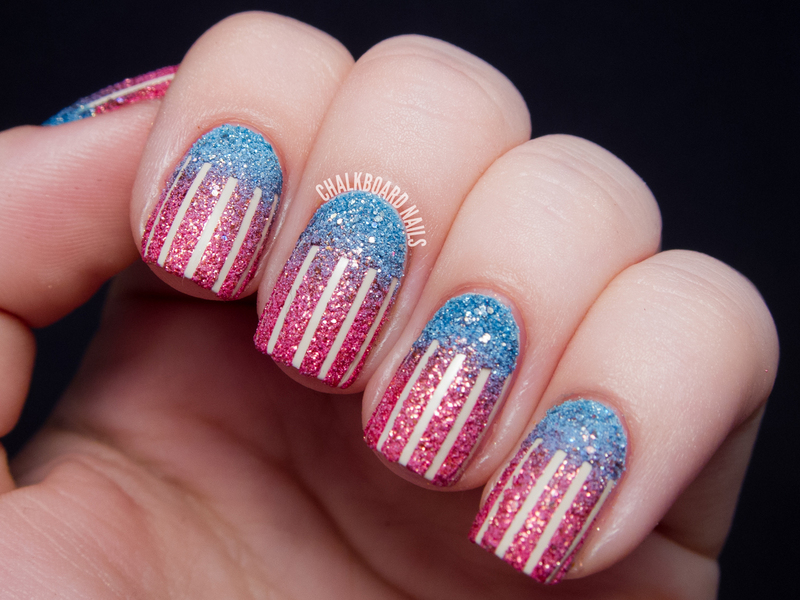 Makes me want to do something like this for the next patriotic holiday! This design is so creative. I love the abstract faded interpretation of the flag, sponging the textured polishes gives amazing results. wow! I'm speechless! It's amazing and so creative! Hi Heather! It's a gradient sponge technique where you paint polish right on a sponge and then use that to transfer the polish to your nails. Yep! I think what happens is that the regular polish part of the textured polish base gets soaked up, but the chunky textured pieces remain on the sponge surface. Pretty neat!